You’re excited to build a new home, and timber frame houses have caught your eye. Should you go with a traditional steel-frame structure or a timber frame? These frequently asked questions (FAQs) on timber frame houses can help you decide how to create the home of your dreams. What is a Timber Frame House? Timber frame homes are constructed with timber beams and posts held together with wood pegs, mechanical fasteners and mortise and tenon frame joints. Most of the timber beams are exposed, which is part of the appeal. Are Timber Frame Homes the Same as Log Homes? No! The walls of a Log home are built by stacking logs horizontally on top of each other. These logs are typically exposed on the outside resulting in an easily recognizable look. Timber homes are built with milled beams and posts, and the exterior of a timber home is protected by siding. This means that the exterior may not appear different from a stud framed home. The reasons are many! 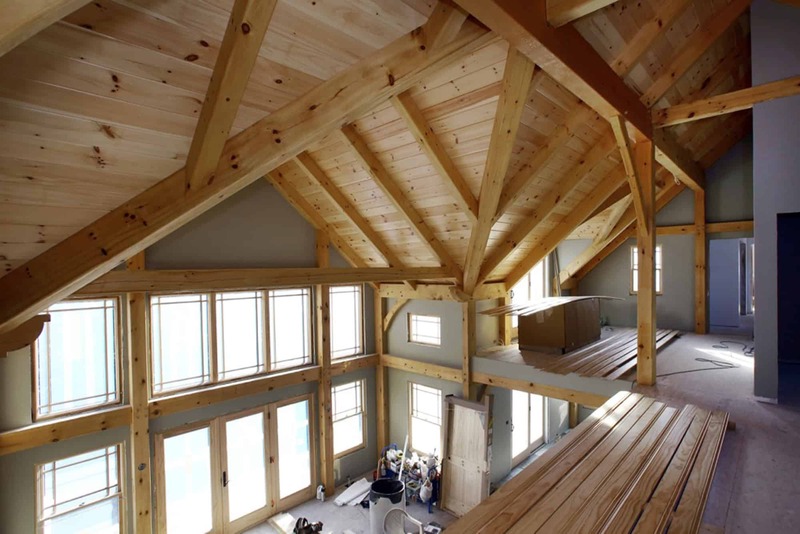 For most people, the aesthetics of a timber frame home are the number-one reason. As a natural material, wood is warm and inviting. Exposed beams and rafters give the appearance of more space and provide a charming look. Joints can be simple or decorative, adding to the visual appeal. Can I afford a timber frame home? You will most likely spend more money on a timber frame home than a stud framed home. However, when combined with state of the art insulation products, and other efficient systems, such as lighting and mechanical, the resulting structure may actually save money on your recurring utility bills. There are many options that allow us to work within your budget! Contact us for an estimate. How Much Design Flexibility Does Wood Offer? Wood is versatile in terms of creativity. Designs can be as simple, creative, or diverse as you want for your home. Timber comes in different sizes, shapes and colors, giving the home builder lots of options. Because timber frame construction is so strong, the layout design is very versatile. Home owners can enjoy open great rooms, kitchens, dining rooms, and entry ways. Depending on the style, we can build a 40-foot plus structure in a free span. Wood is also a great choice for surface treatments. Wood holds paint much longer than metal or concrete, up to 12 to 15 or more years. It’s much less expensive to repaint than rebuild, and if you get bored with the color, it’s a quick fix to paint over with a fun, new color that gives your home a different look. How Durable are Timber Frame Homes? When properly protected from the environment, wood is very durable. Timber frame structures have lasted hundreds of years. Even in a fire, it is possible that the structure will not collapse. Even though wood will burn, it takes a very long time to burn through an entire beam or post. There are examples of timber frame buildings that burnt to the ground except for the timber posts and beams which were left standing. Will I have to maintain a timber frame home? There are no entirely maintenance-free building products. Wood siding should be refinished every five to six years, depending on the finished product. The warranties for synthetic materials such as vinyl or fiber cement range from 15 – 40 years. The interior can be left natural (it will darken over time), which is part of the aesthetic appeal of timber. Acquiring the wood for a timber frame structure should be factored into the schedule of your project. The different sizes of timbers used in a timber frame structure are not as standardized as the dimensional lumber used in a typical stud framed home. With this in mind, sometimes the timber supplier will need a few weeks to order the timber package, especially if you decide to use kiln dried timber. How are Timber Frame Homes Insulated? There are many options for insulating a timber frame home. However, we recommend that insulation panels be installed on the outside of the house rather than the inside, eliminating the need for studs. This system more easily achieves high R-values (how well the house is insulated) compared to stud framing. How Energy Efficient are Timber Frame Homes? When using the insulation system described above combined with high quality windows and doors, a timber frame home is very energy efficient. Will I need to consider wood destroying insects? Yes, although mostly for exterior porches and accents. There are some wood types that are less vulnerable. It is important to make sure that the building is sealed properly around the foundation and the base of the siding to prevent damage. Aesthetics, design versatility, low cost and energy efficiency are all attractive reasons to choose a timber frame for your new home!